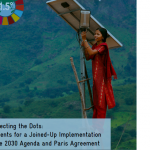 This study by WRI and GIZ on national-level implementation of the 2030 Agenda for Sustainable Development and the Paris Agreement on climate change suggests that both proceed on different tracks, despite the growing recognition of the ample opportunities they present for synergies. Drawing on experience in 11 countries and the European Union, this paper provides core elements and concrete examples for jointly advancing these agendas, with a focus on five challenges: coordinating institutions, ensuring alignment and synergy of SDG and NDC targets, mainstreaming both sets of goals into policy planning, optimizing financial resources, and building mutually reinforcing monitoring and reporting frameworks. The research also explores how international development can better support national efforts at linking both agendas. This study shows that joining up implementation requires governments to make significant shifts in institutional, policy, financial, and monitoring frameworks in order to enhance policy coherence, and cost efficiency.